This film brings the sport of boxing alive, revealing its unique relationship with the Civil Rights movement and the raw consequences of a fighter’s life. 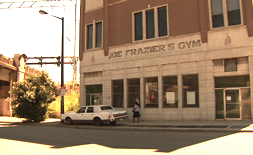 The film has a strong contemporary narrative but the story of Joe’s gym is interwoven with a sense of perspective and history, giving weight and context to what’s happening in Joe’s life and in North Philadelphia. We cover all the major events of Joe’s life and career. He escaped to the North after a fight with a US Marine from the military base near his home. Back in those days, as his best friend Abe Brown tells us “something like that happen and you’re gone”. We learn of his Gold Medal victory in the Tokyo 1964 Olympics and the lack of recognition he faced on his return to the US. But this is no ordinary biography. Joe’s early struggles lead us back to the story of the gym he runs today – part teen center part senior center. We meet Isaiah Muneer – a young boxer who dreams of escape. We visit Isaiah in his neighborhood. “Shootings, there’s always shootings, that’s like hearing the bus stop, or the doorbell ring.” Why does Isaiah believe, that in the 21st Century, boxing is the only way out? Philadelphia, with over 400 murders last year, is one of the most violent cities in America. The film brings to life the ongoing relevance to the socio economic issues highlighted in the era of Frazier/Ali. We see how Joe and his son Marvis – a preacher and former boxer himself – reach out to the community and how Isaiah is only one of the many people they have touched. 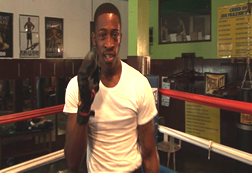 We initially follow Isaiah’s training and hopes of winning the Golden Gloves. Only things don’t go to plan. He’s is arrested and imprisoned. We follow his case and Marvis’ efforts to help him. Boxing, more than ever, looks like his last hope – but will there be a gym to return to? We learn it is under threat. Throughout the film, key witnesses and participants share their views: from HBO’s Larry Merchant, to contemporary fighters such as Larry Holmes, Bernard Hopkins and George Foreman and writers – Ali’s biographer Thomas Hauser and Claude Lewis, a Philadelphia journalist who established the National Association of Black Journalists. Despite the ‘Uncle Tom’ picture painted of him during the Ali years, Joe has stayed very true to his roots. He is part of the unique Gullah Community of the Southern United States. Self-proclaimed ‘Queen of the Gullah’ Marquetta Goodwine tells us – “you don’t know where you’re going, if you don’t know where you’re from”. She says it is Joe’s past that has inspired him to ‘reach his hand back’ to help others. Sitting in Madison Square Garden, Joe reflects on his remarkable life. Ali’s biographer Thomas Hauser says that while Ali is now mainstream, Joe has been largely forgotten “and that’s very sad”. The fictional Rocky has a statue in Philly but not the real Joe Frazier. Marvis shows us his grand plans for the gym: a legacy to his father. We realize it is a fragile dream. After forty years the gym has to close. The cost of upkeep is more than Joe, Marvis and their supporters can manage. We see Isaiah one last time in prison. Marvis says a prayer. He believes that God answers when you call. People reflect on the gym’s importance and the lack of recognition Joe has had. Joe is with Marvis in the now empty gym. He says ‘we have given all of ourselves, in more ways than one’. Ali has cast a long shadow over his life but he has come to terms with the past and has found meaning in the work of his gym. Over four years in the making, 'Joe Frazier: When the Smoke Clears' is finally finished. Plans are in place to bring the film to boxing fans on DVD.